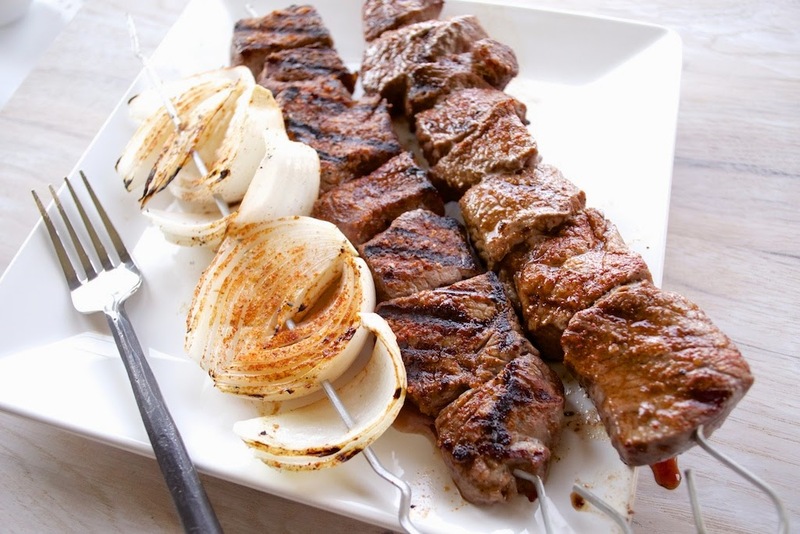 Feeding Our Lives, LLC: Kebobs! Our neighborhood celebrated Memorial Day with a community potluck. We opted to bring grilled corn-on-the-cob, and since the grill was going to be hot and ready, I decided we should throw other stuff on the grill, too. Oh. My. Goodness. What a fabulous decision! Growing up in the south, kebobs aren't uncommon, but they aren't sought after, either. Living on the east coast, kebobs are all-the-rage! Seriously, there are multiple restaurants in just our town that only serve kebobs. It's a thing here. So, after six years of living here, I decided to finally make my own kebobs. And, man-oh-man, they were divine! ** slice the red onion in half, through the stem. Then quarter the halves. This method keeps your onions together. ** Throw everything into a resealable bag and pour in olive oil, salt, and pepper. Don't skimp! You want everything covered with olive oil and enough salt and pepper to be on every item in the bags. ** After stirring the contents of the bag, store in the refrigerator for at least 6 hours. ** Throw onto a hot grill, and then turn down the heat. Cook each skewer until done (they'll be done at different times).